We have successfully manufactured 100% functional 3D printed valve caps. 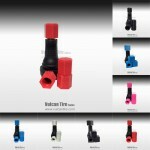 Using new 3D printing technology we have created a line of colorful valve caps for your vehicle. These 3D printed caps are the first of their kind as they feature fine, printed threads and precise mating surfaces that allow for an air-tight seal.